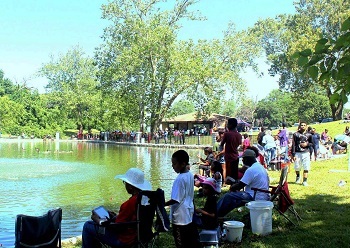 On a glorious morning in June, several hundred eager kids turned out at a glistening Spring Valley Park Lake for the Urban Kids Fishing Derby. For many of the kids, ranging in ages from 4 to 16, the June 17 event brought a mix of nervousness and excitement as they picked up a rod and reel for the first time. The pond was prestocked with 1,800 pounds of fish, giving everyone an ample opportunity to catch a fish for the first time in their young lives. By the end of the day nearly every one of the kids had learned the general basics of fishing as they snared catfish, bluegill and largemouth bass. “It was neat to watch a child learn how to fish, watching them grow from a novice early in the day to catching a fish on their own and removing it from the hook like a pro,” said Aaron Hoeppner, business development coordinator for the Kansas City Area Transportation Authority. The KCATA helped sponsor the event, sending staffers out to help the kids learn to fish and spread the message of public transportation. The Authority also sent its “Hope” bus, a specially wrapped pink bus with a ribbon calling attention to the battle against breast cancer. Leading the KCATA contingent was Frank White III, the agency’s chief marketing officer. The KCATA agreed to support the event as way of contributing to the community. Watching young children get a taste of the outdoors was particularly moving, he said. As they fished, children chomped on hotdogs, chips, popsicles and other refreshments. While the KCATA marketing staff used the event as an opportunity to promote transit service, the agency also wanted to highlight the recreational opportunities in the city. KCATA staff handed out material about the summer youth pass, which for $12 a month saves 60 percent on the cost of a bus pass for anyone 18 and under.